This career was originally introduced in the Sims Life Stories and hasn't appeared in another Sim game since, so here is my version of it for the Sims 4! 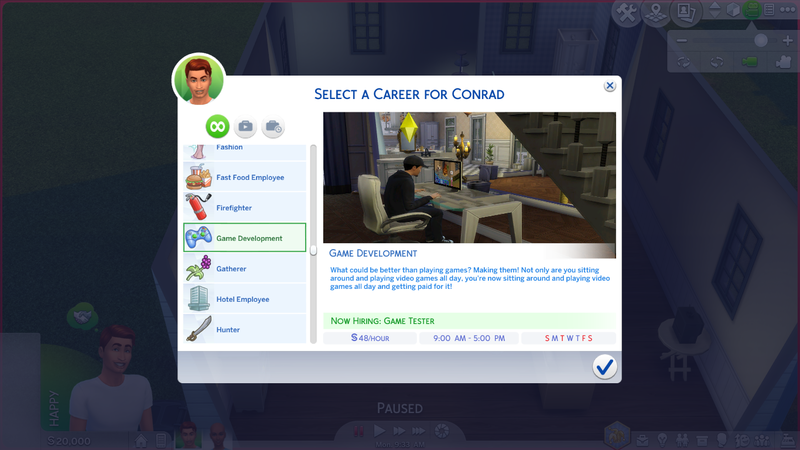 This career is mostly the same as it's Life Stories counterpart, but the skills Sims will nred to learn are slightly different. This is a one track rabbit hole career that currently does not have any chance cards, daily tasks etc but I hope to add more in the future! 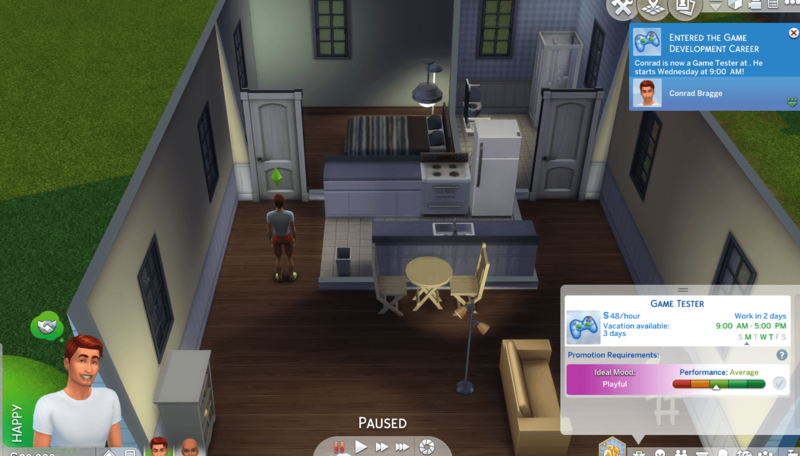 Sims in this career will need to learn the Logic, Video Gaming and Programming skills! What could be better than playing games? Making them! Not only are you sitting around and playing video games all day, you're now sitting around and playing video games all day and getting paid for it! You no longer have time to sit around and play video games all day, because now you'll be sitting around playing video games all day and getting paid for it. The money isn't great but the job is low-impact and low stress, at least most of the time. You know how to find serious bugs and get the attention needed from the programmers to get them dealt with. Since you've demonstrated such leadership and communication skills, you're going to be writing a lot of reports for the testing manager, which is going to take some time away from testing games. Broken game builds, overworked testers and the drink machine refusing to refrigerate during mass overtime—you've seen, and gotten through, it all. As the head of the testing department, you don't have much time to actually test games now since you spend most your days managing the lead testers and reading reports. You're ready to become the envy of your friends in the test department because now you get to create original content for the games they'll be testing. Of course, chaining yourself to your desk and writing hundreds of object descriptions qualifies as original content creation, but you can let them dream. Although you won't see your name in the title above the box art any time soon, you have more of a say in what the final game will look and play like. You are also free to assign those hundreds of object descriptions to that new associate designer. Your name is above the title on the box art, and gaming journalists clamor to find out what kind of socks you wear. Major gaming fan sites post comic strips poking fun at every intimate detail of your personal life—fortunately, they don't know many of them. You know how to find serious bugs and get the attention needed from the programmers to get them dealt with. Since you've demonstrated such leadership and communication skills, you're going to be writing a lot of reports for the testing manager, which is going to take some time away from testing games. After the unbridled creativity that design had to offer, you've traded your jeans for slacks and moved over to the business side of game development. Instead of wrangling character designs, now you wrangle the wranglers of character designs in an effort to bring the projects in on time and under budget. As a director, you are responsible for overseeing multiple teams with multiple projects and multiple deadlines, which often leaves you with multiple headaches. Make more friends for much-needed emotional support as you thrill them with tales of clashing egos and deadline chaos. You have been made executive vice president, and get to overhear the president of the company play video games all day in your cushy new office. There are a lot of responsibilities to the company at the highest levels of finance and management, but you also find time to join the president for gaming research sessions now and then. When you walked into the company offices on your first day as a tester and muttered something about the company being yours one day, you were obviously right. Some may think that all you do is play video games; but your job is to understand how to pay people to make games, and hopefully cause some entertainment and happiness for your efforts.